Seth Godin was running successful online promotions before the web was even an active consumer market. Godin was the first mega-online marketer on the Internet! Anyone who wants to see clearly the future and what marketing is a good value, like the books of the last generation on the value of your ad dollar by John Caple’s, Godin’s book “Permission Marketing” is a must read for today’s online marketer. Every business with an online aspect should spend an hour or two with Godin to save hundreds of hours and maybe gain insights that equal a new customer/business relationship. 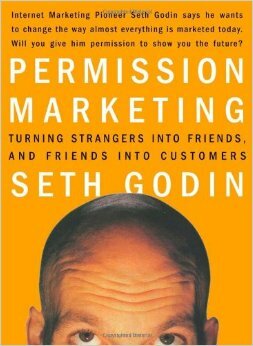 Godin explains why “Interruption Marketing” isn’t working and how Permission Marketing works and why. Intellectual and logical marketing gold! Thank you Mr. Godin!